When the honeymoon is over, newlyweds must go back to the real world. The real world is often a colder location with less fruity drinks and no mini-bar. Which way the toilet paper unravels and whether socks should be folded or tossed in the bottom drawer are minor hiccups in married life. A more significant topic is the finances of the newly blended household. The best financial advice for newlyweds is to prepare before the wedding, stick to the plan, and adjust based on life circumstances. Talk to your spouse. Each member of a new couple comes from a distinct household. Your husband’s mother may have paid all the bills while his father could barely balance a checkbook. He may assume your household finances will be handled the same way. If the woman would prefer an equal contribution and an even split of financial duties, it pays to have a pre-wedding discussion with her husband. Decide who will pay the bills. Determine whether the husband and wife will retain two separate accounts, hold one joint account, or maintain separate accounts with a shared account for mutual expenses. The pre-wedding talk prevents financial surprises after the wedding and makes the transition to married life a little smoother. Congratulations on your marriage! The checkbook may be perfectly balanced. The bills may be paid earlier than due. However, personality differences that impact the way money is handled may become more apparent. A husband may notice frequent deliveries of shoes from Zappos resulting from his wife’s online shopping habit. A wife may notice high credit card fees for fishing and hunting gear at Bass Pro Shop. Recognize that your spouse has different financial priorities, but the couple can still share the same financial goals. Likewise, a saver and a spender can co-exist in marital harmony but will need to make some compromises. Perhaps the spender can bring her lunches to work but splurge on a weekly date night including a five course dinner with her husband. Maybe the saver can set a yearly vacation budget but let his wife indulge in an extravagant massage on the beach. The newlywed glow can last many years. Of course, life presents us with many surprises. If the couple is blessed with children, how will financial goals change? Saving for college tuition can become a more important priority than saving for a Cabo timeshare. Will the couple pay for daycare or will one spouse stay at home to care for the children? The couple will need to be realistic about the spending differences between a two and a one income household. Aging parents, medical expenses from disease, and promotions or demotions at work will also require financial adjustments. Finances can be a stressful part of life. It follows that they are a stressor in marriage. Some preparation is possible and recommended. 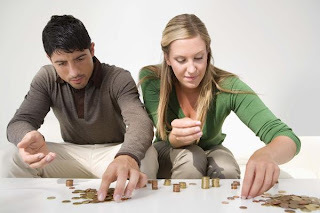 Both members of the couple must be accountable for achieving shared financial goals. Most importantly, both members must have input when plans change. Be prepared for a change of financial priorities. Remember the commitment made on your wedding day. The words “for richer or poorer” will echo throughout your marriage. If only the fruity drinks lasted past the wedding! Facing down the financial responsibilities of a family can get pretty scary. I know that I had a hard time deciding on insurance. The Guelph insurance companies were all very patience with me as we compared rates for everything from life to car insurance. In the end, you're right. Everything is an adjustment after you get married. Thank you for this post! One thing that a lot of newlyweds forget about is car insurance, and it is much more important than they think! They really can't afford NOT to get car insurance when just starting out! This really is something more people should consider in advance. When my sister was starting out I think she got lucky with things like nova scotia car insurance that was long term economically advantageous but a lot of people don't have as much luck.